Although it is the least noticed by patients, effective documentation is one of the most critical skills that speech-language pathologists must learn. With that in mind, Documentation and Reimbursement for Speech-Language Pathologists: Principles and Practice provides a comprehensive guide to documentation, coding, and reimbursement across all work settings. The text begins with section 1 covering the importance of documentation and the basic rules, both ethical and legal, followed by an exploration of the various documentation forms and formats. Also included are tips on how to use electronic health records, as well as different coding systems for diagnosis and for procedures, with an emphasis on the link between coding, reimbursement, and the documentation to support reimbursement. Section 2 explains the importance of focusing on function in patient-centered care with the ICF as the conceptual model, then goes on to cover each of the types of services speech-language pathologists provide: evaluation, treatment planning, therapy, and discharge planning. Multiple examples of forms and formats are given for each. In section 3, Nancy Swigert and her expert team of contributors dedicate each chapter to a work setting in which speech-language pathologists might work, whether adult or pediatric, because each setting has its own set of documentation and reimbursement challenges. And since client documentation is not the only kind of writing done by speech-language pathologists, a separate chapter on “other professional writing” includes information on how to write correspondence, avoid common mistakes, and even prepare effective PowerPoint presentations. Each chapter in Documentation and Reimbursement for Speech-Language Pathologists contains activities to apply information learned in that chapter as well as review questions for students to test their knowledge. Customizable samples of many types of forms and reports are also available. 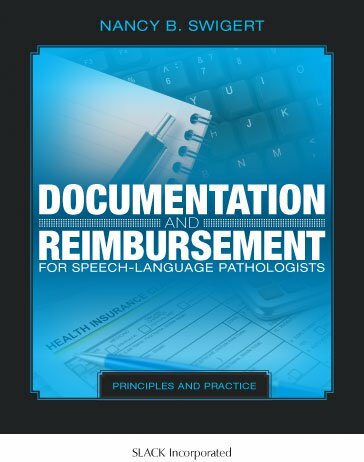 Documentation and Reimbursement for Speech-Language Pathologists: Principles and Practice is the perfect text for speech-language pathology students to learn these vital skills, but it will also provide clinical supervisors, new clinicians, and speech-language pathologists starting a private practice or managing a department with essential information about documentation, coding, and reimbursement. Nancy B. Swigert, MA, CCC-SLP, BCS­S, speech­ language pathologist, is the former director of Speech­ Language Pathology and Respiratory Care at Baptist Health Lexington, an acute care facility in Lexington, Kentucky. Prior to that, her private practice, Swigert & Associates, Inc., provided services to children and adults for 26 years. In 2016-2017 she served as the Pro­cess Excellence Coordinator and a Certified Green Belt in Lean/Six Sigma in the Quality Outcomes Department at Baptist, where she coached teams to use data and Lean/Six Sigma pro­cess improvement methodologies. As president of Swigert & Associates., Inc., now a consulting com­pany, she continues to teach and write in the areas of dysphagia, coding and reimbursement, and documentation. Her main clinical interests are in the areas of pediatric and adult dysphagia. She has authored seven publications with Pro­Ed (Linguisystems): The Source for Dysphagia (4th Edition), The Source for Dysarthria (2nd Edition), The Source for Pediatric Dysphagia (2nd Edition), The Source for Reading Fluency, The Source for Early Intervention, The Source for ­Children’s Voice Disorders, and Reading Fluency and Comprehension. She lectures extensively in the areas of dysphagia and motor speech disorders. She has authored numerous book chapters and articles focusing on documentation and reimbursement. She received her master’s degree from the University of Tennessee—Knoxville. She is a former President of the Kentucky Speech­Language­Hearing Association and the Council of State Association Presidents. She was President of the American Speech-Language-Hearing Foundation in 2004-2005. She chaired the American Board of Swallowing and Swallowing Disorders from 2012-2014. She has served in numerous volunteer capacities for the American Speech­Language-Hearing Association (ASHA). In the mid-1990s, she co-chaired the ASHA Task Force on Treatment Outcomes, which initially developed the National Outcomes Mea­sure­ment System (NOMS). She served on the Health Care Economics Committee for 9 years and chaired it for 6. It was during that tenure that she gained invaluable knowledge about reimbursement and documentation requirements. She served on the ASHA Executive Board for 6 years, 3 as Vice ­President for Governmental and Social Policies and then as President-­Elect, President (1998), and Past President. She is an ASHA Fellow and received the Honors of ASHA in 2015.